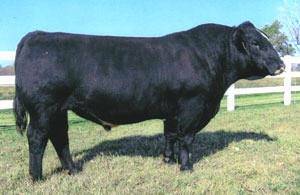 A black baldy bull who is siring exceptionally consistent, sound, fancy, and deep progeny for JS Simmentals, IA. Motown's first progeny were well received at the 2005 sales that they were consigned to. He himself was Champion Bull at the 2004 Dixie National, and is out of the legendary donor, Antoinette K205. Motown's full sister is the fantastic 2005 National Western Champion Female, Expectation.